Algernon Charles Swinburne (1837-1909) was an English Poet, dramatist and a critic of the Victorian England who was famous for his poetry and infamous for his Victorian morality violent attacks. 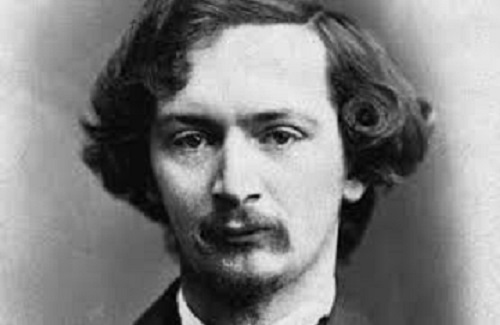 Swinburne was born in April 1837 in Grosvenor place in London. His father was an admiral and his mother was a daughter of the 3rd Earl of Ashburnham. His education took place at Eton and Balliol College in Oxford which was left by him in 1860 without degree completion. He met William Morris, Dante Gabriel Rossetti and Edward Jones there with whom he took a keen interest in Pre Raphaelite Brotherhood. Later his father allowed him to pursue his career in literature. In the 1860’s he faced an unhappy love affair about which much is not known. In 1861 Swinburne met Richard Monckton Milnes who appreciated and encouraged his writing and promoted his reputation. In 1865 he became successful after writing of the verse drama Atlanta in Calydon where he recreated the spirit and form of Greek Tragedy in English. This was followed by another masterpiece work with the first series of “Poems and Ballads” in 1866. The second series appeared in 1878 which was less hectic and sensual. During this time his health deteriorated due to excessive alcohol experiencing abnormal temperament and periodic fits of nervous excitement. In 1879 his health completely collapsed and was restored by his friend Theodore Dunton. The last 30 years of his life were spent at The Pines, Putney under his guardianship. He eventually became a respectable public figure and he published 23 volumes of poetry, prose, and drama in these years. He was also an important and prolific English literary critic of the 19th century. He died in 1909 due to influenza. Glory to man is the highest! For man is the master of things. From too much of love of living, From hope and fear set free, We thank with brief thanksgiving whatever gods may be that no life lives forever; That dead men rise up never; That even the weariest river winds somewhere safe to sea. At the door of life, by the gate of breath, there are worse things waiting for men than death. Fierce midnights and famishing morrows, and the loves that complete and control all the joys of the flesh, all the sorrows that wear out the soul. Though one were strong as seven, he too with death shall dwell, nor wake with wings in heaven, nor weep or pains in hell. We are not sure of sorrow, and joy was never sure; today will die tomorrow; Time stops to no man’s lure. “The Garden of Proserpine” is composed by Algernon Swinburne in the year 1866 and was published in his collection “Poems and Ballads.” It is one of the most outstanding atheistical poems that is ever written. It is one of the musical masterpieces that is beautifully written in agnostic grandeur. This poem displays an alluring fragrance of godlessness and the weariness of the world which delights all the pessimist poets. The poem depicts the Greek pagan Goddess Proserpine clashing relationship with life and death illustrating the complicated but complementary nature of life and death. In the poem, the dead speaker describes everything around him from the underworld. He states that death is imminent despite one’s great power and strength. He also claims that death is final and there are no such things like hell and heaven after death. He also presents that beauty and love are also perishable with person death. Proserpine and the garden depicted here are both paradoxical. The poem consists of twelve stanzas with 8 lines in each stanza. The rhyming scheme is ABABCCCD and at the end of the poem, the stress is shown.